A court ordered on Wednesday that Panama's former Vice-President Felipe Virzi be held while he is investigated for alleged corruption. Investigators allege that Mr Virzi received a $10m-kickback (£6.5m) from a company which won a lucrative irrigation contract, which he denies. The company's executives were arrested days ago trying to leave Panama. Mr Virzi is the latest in a series of high-ranking officials from former administrations to face investigation. In January, the Supreme Court appointed a special prosecutor to investigate claims that former President Ricardo Martinelli had inflated multi-million dollar contracts during his time in office from 2009 to 2014. Mr Martinelli denied the allegations and said they were part of a political vendetta waged against him by his successor in office, Juan Carlos Varela. 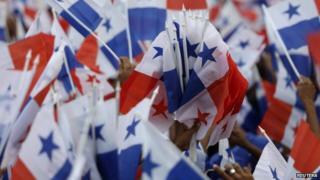 Mr Varela, who was elected last year, campaigned on a promise to clean up Panamanian politics. The investigation into Mr Virzi centres around allegations that he received $10m from a company hired by the government of Mr Martinelli to build a huge irrigation system in the Tonosi region of Panama. At the time of the alleged payment, Mr Virzi was no longer vice-president but investigators said he still had close links with the government. On Monday, Mr Martinelli defended Mr Virzi, whom he referred to by his nickname, Pipo. The former president said that "for 40 years we have conducted all kinds of legal business with Pipo Virzi, buying, selling, renting and borrowing. Why is this getting so much negative attention?". The irrigation system was never built and the company's chief executives are under arrest. Mr Virzi has been charged with money laundering and corruption.